Rajnath Singh celebrated new year with Jawans of the Indo-Tibetan Border Police (ITBP) at a border-out-post in district Uttarkashi on Monday. Last year, Union Home Minister Rajnath Singh celebrated Dussehra at three out post in Chamoli. Many soldiers suffer from various disease after working in high altitude. The Union Minister has also asked for providing light weight special clothing to all the soldiers working in posts located above 9,000 feet above sea level. 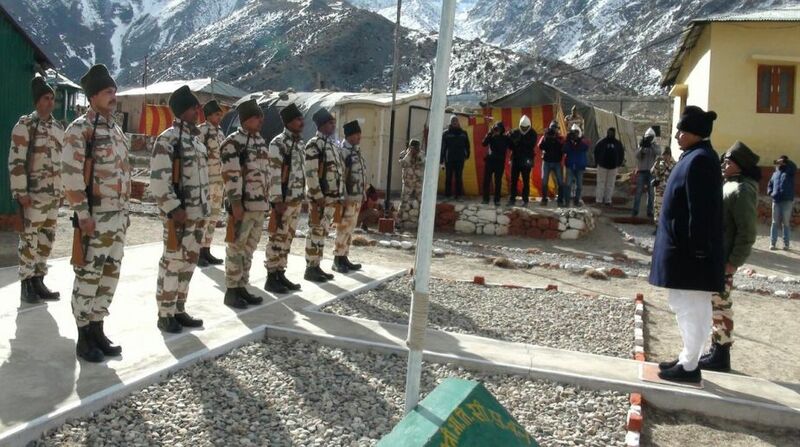 Presently such facilities are offered to solders serving at 14,000 feet above sea level. Rajnath concluded his two-day visit to Uttarakhand on Monday. He arrived on Sunday and participated in ‘Bara Khana’ of the 12th Battalion of Indo-Tibetan Border Police, at Matli (Uttarkashi). On day two of his tour, Rajnath Singh reached the Nelong border-out-post of the ITBP located at 11,636 feet above sea level to celebrate the new year. This is the first ever visit by the Union Home Minister to the Nelong Valley. Last year in September-October, Rajnath Singh had visited Mana, Lapthal and Rimkhim border-out-posts besides various other formations of ITBP- Mountaineering & Skiing Institute at Auli near Joshimath and Gauchar and had celebrated Dusehera with ITBP Jawans.